"Looks similar to colcannon, but champ is native to the North of Ireland. 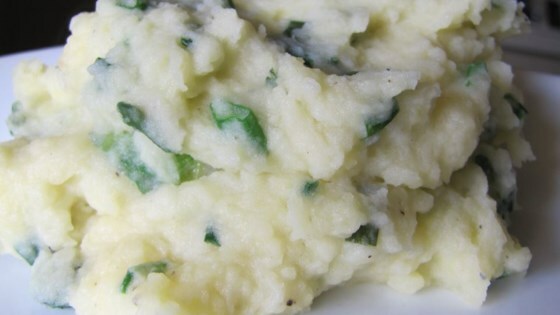 It's made by blending scallions or green onions with creamy mashed potatoes. Great on its own, served steaming hot with extra butter which will melt through it. But it's also the perfect side dish for good quality sausages." Place potatoes into large pot, and fill with enough water to cover. Bring to a boil, and cook until tender, about 20 minutes. Meanwhile, heat the milk and green onions gently in a saucepan, until warm. Mash the potatoes, salt and butter together until smooth. Stir in the milk and green onion until evenly mixed. Season with freshly ground black pepper. Serve piping hot in bowls. Set out some extra butter for individuals to add to their servings. Similar to delicious colcannon, this dish is native to Northern Ireland! This was good, but to be honest it's really just mashed potatoes with green onions in it. It was a nice flavour, we'll probably make it again. This was really good, but we thought it was lacking a little something. Hubby stirred in some sour cream which really made it pop! Yummy. This was easy to make and tastes good too. It went great with the Irish Stew, Corned beef and cabbage.